Habit: Shrub, tree, evergreen; monoecious. Stem: young crown conic; twig not grooved, resinous, generally persistent. Leaf: simple, generally alternate, sometimes in bundles or appearing +- 2-ranked, linear or awl-like; base decurrent, woody or not, persistent several years. Pollen Cone: generally < 6 cm, not woody, deciduous. Seed Cone: generally woody; bracts, scales generally persistent; scale not peltate, fused to or free from subtending bract. Seed: 2, on scale base adaxially. Genera In Family: 10 genera, 193 species: generally northern hemisphere; many of great commercial value, supplying > 1/2 of world's timber. Stem: young crown conic, mature often rounded or flat; branches +- whorled in young plants; young bark smooth, mature furrowed; bud +- conic, generally resinous. Leaf: generally 2.5--35 cm, generally sessile, in bundles of (1)2--5; bundles 1 in axils of alternate, awl-like bracts, base in a sometimes deciduous, scaly sheath of bracts, generally persistent several years. Seed Cone: often whorled, generally maturing, opening 2nd year, persistent on stem or not; stalk 0 or < 16 cm; bract included, fused to scale at least basally, minute; scale tip reflexed, elongated 3--7 cm or often with a rounded or angled, often prickled knob < 3 cm. Seed: coat hard, woody or not. Chromosomes: 2n=24. Species In Genus: 94 species: northern hemisphere. Etymology: (Latin: pine) Note: Pinus pinea L., stone pine (leaves 2 per bundle, 10--30 cm; seed cone 8--15 cm, maturing in 3 years) cultivated in Europe for over 6000 years for edible seeds (pine nuts), reportedly naturalized in SnFrB, northern ChI. Unabridged Note: Morphological, genetic study of relationships among Pinus jeffreyi, Pinus ponderosa, and Pinus washoensis indicates that the taxa should be classified as 2 species, Pinus jeffreyi and Pinus ponderosa, and that the latter comprises three varieties: Pinus ponderosa var. pacifica (new taxon), Pinus ponderosa var. ponderosa, and Pinus ponderosa var. washoensis (new combination). Stem: trunk < 36 m, < 1.1 m wide; bark gray-brown; mature crown with several tops or not, branches many. Leaf: 3 per bundle, 6--16 cm, yellow-green; sheath persistent. Seed Cone: recurved to reflexed, 6--18 cm, asymmetric, yellow-brown, often closed unless burned, on stem many years; stalk < 2 cm, +- 0 with stem growth; proximal scale tip knobs > 2 cm, angled, prickled. Seed: < wing. 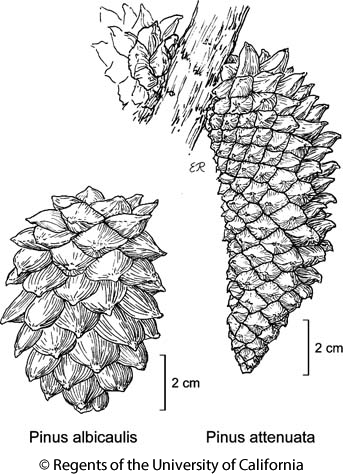 Ecology: Closed-cone-pine forest, chaparral; Elevation: < 2000 m. Bioregional Distribution: NW, CaR, SN, e SnFrB, SCoR, SnBr, PR, MP; Distribution Outside California: southwestern Oregon, Baja California. Citation for this treatment: J. Robert Haller & Nancy J. Vivrette 2012, Pinus attenuata, in Jepson Flora Project (eds.) Jepson eFlora, http://ucjeps.berkeley.edu/eflora/eflora_display.php?tid=38257, accessed on April 19, 2019. NW, CaR, SN, e SnFrB, SCoR, SnBr, PR, MP; Markers link to CCH specimen records. Yellow markers indicate records that may provide evidence for eFlora range revision or may have georeferencing or identification issues. Purple markers indicate specimens collected from a garden, greenhouse, or other non-wild location.